In some places it’s wind, in others it’s heat, but here in northern Wisconsin and the UP, it’s snow and ice that need to be considered when it’s time to buy new winter roofing in northern WI and the Upper Peninsula. Our exclusive, beautiful Snow Country Metal Roofs were designed to lock the shingles in at the valley and gable edge. By locking the shingles down, it becomes very difficult for sliding snow to get under the shingles and damage the roof. Metal roofing of lesser quality with screw-through installation and glued-on granules cause snow to stay upon the roof. 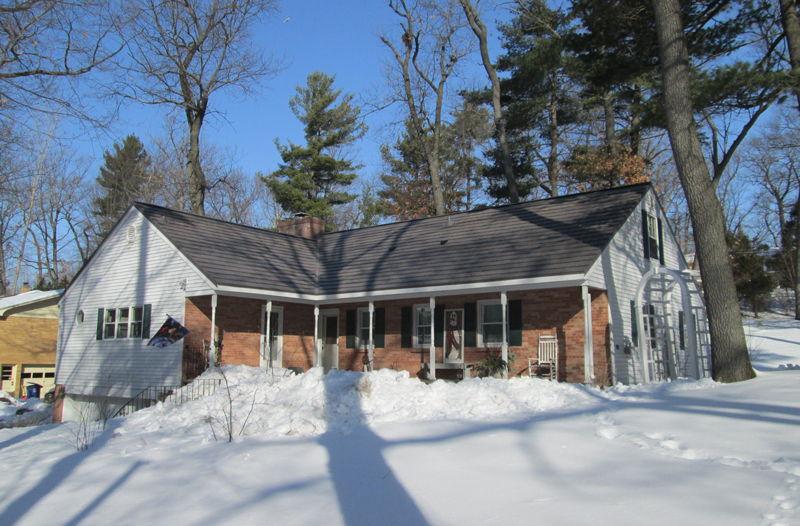 When you choose a snow roof in northern Wisconsin from American Metal Roofing, you’ll get the peace of mind that comes with knowing that your home is protected from snow and ice. Snow slides from a metal roof are desirable actions. It is Mother Nature’s way of cleaning the roof in the winter. Why Do Roof Snow Slides Matter? One of the dangers of a snow slide is the damage to your metal roof. This damage comes as a result of heavy build-ups of snow being forced sideways by an opposing gable across a valley. This sideways movement of snow can bend the ribs on even the stoutest of standing seam steel roofs, causing permanent damage. Our snow roofs in northern WI are specifically designed to withstand the snow slides that are common in areas such as Wisconsin and the Upper Peninsula of Michigan. Why do Roof Ice Dams Matter? Picturesque as they might be with twinkling lights, ice build ups on or from your home’s roof are not desirable. In addition to damaging the gutters and roof, who and what is below those large daggers of ice can be damaged, too. Trust the experts at American Metal Roofing to install winter roofing in northern WI and the Upper Peninsula that’s built to hold up under winter conditions. How do Snow Country Metal Roofs Prevent Ice Dams? The roofing materials don’t prevent ice dams and snow build-up…but proper roof ventilation and expert installation do. Attic ventilation is an important component contributing to the health, safety, and energy efficiency of your home. That’s why each and every roofing project from American Metal Roofs of Wisconsin starts with a thorough attic inspection. From the very beginning, we plan for the proper installation and maintenance of your Snow Country Roof, giving you a lifetime of protection, comfort, and peace of mind. Beautiful Snow Country Metal Roofs are available in Oxford Shingle and Rustic Shingle styles and colors, exclusively by American Metal Roofs of Northern Wisconsin for Classic Metal Roofing Systems.